CE & RHOS TESTED AND APPROVED. 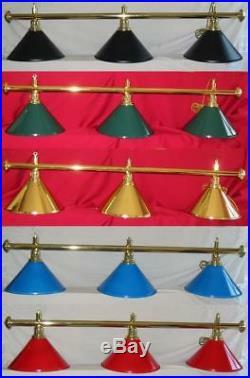 5' LUXURY top quality ornate lighting rail finished in brass with 3 virtually unbreakable metal shades. Green, Blue, Black, Brass or Red shades available, leave message at checkout. SEE MY FEEDBACK FOR COMMENTS LIKE----------"FAR NICER THAN PICTURED----SUPERB VALUE". These lights are brand new with full 12 month guarantee. This is a FULL SIZE 38mm thick (1 1/2") light bar 1.50 metres long (60 "). Suitable for all 6' - 7' and 8' tables. 2 brass ceiling roses, 2 brass chains and not to be confused with other smaller cheaper lights. 2 fittings are important to stop light rail from swinging round. Each of the 3 metal shades has a diameter of 38cms (15) they are bright white inside to reflect the correct amount of light for enhancing your game. The shades take either 3 X 60 Watt bulbs or 3 X bright low energy bulbs(not supplied). Will be delivered to you direct in manufacturers original boxes. Will light up and enhance your table and help you see the balls more clearly therefore helping to improve your play. These lights will be an asset to any room with their smart and attractive appearance. Supplied complete, fully wired with 2 brass ceiling roses, brass chains, etc. These lights weigh only about 7 kilos and therefore no strengthening is required to hang these from a ceiling, only reasonably firm anchorage points as with any normal light fittings. The item "Rosetta Brass Pool Snooker Billiard Table lighting light shade red black green" is in sale since Thursday, August 2, 2018. This item is in the category "Sporting Goods\Snooker & Pool\Table Lighting/ Lamps". The seller is "allenronnie" and is located in Abertillery, S Wales UK.